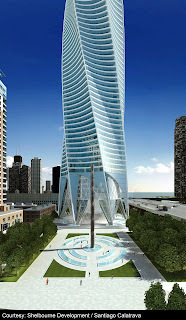 Garrett Kelleher, the developer of the Chicago Spire – designed by Santiago Calatrava – says he has sold 30% of the building’s condo units, which he says is proof that the Spire – the world’s tallest residential structure – will be built. 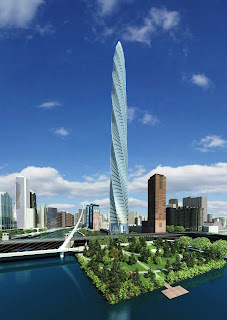 Two-thirds of Singapore buyers have backed out of their purchases of units in the much-hyped Chicago Spire in the United States. A number were apparently spooked by the near-collapse of US investment bank Bear Stearns, which took place a week after the Chicago Spire was launched in Singapore. Mr Colin Tan, the head of research and consultancy at Chesterton International, said it made sense for the buyers to pull out of their deals. ‘Housing prices in the US are coming down, and while some properties may look like a good investment now, you can probably get it cheaper later,’ he said. Experts said those who had seen their purchases through are likely to be more serious buyers who may, for example, have children studying in Chicago. Most of the units that were sold were reported to be one- or two-bedroom apartments that averaged US$1 million each, or US$1,000 per sq ft.
About half the buyers were said to be Singaporeans or permanent residents, and the rest were expatriates. It is understood that to date, about 10 of the Singapore buyers have inked their purchase agreements. At least two of them are believed to be Indonesians. Sources said the Chicago Spire’s exhibitions in Shanghai and Hong Kong, which followed its launch in Singapore, received a lukewarm response as the turmoil in the US financial markets deepened in March.. The Spire is designed with 1,194 units, including a $40 million penthouse, which is still for sale. It is scheduled for completion in 2012. You are currently browsing the archives for the Garrett Kelleher category.